SportsLine's advanced computer model simulated every Sunday game in the NCAA Tournament 10,000 times. Sixty-eight teams started in the 2019 NCAA Tournament bracket, but it'll already be down to 16 when second-round action concludes on Sunday. No. 1 seeds Duke (-13 vs. UCF), Virginia (-11 vs. Oklahoma) and North Carolina (-11.5 vs. Washington) will be in action as they look to avoid big upsets. Meanwhile underdogs such as No. 13 seed UC Irvine (+4.5 vs. Oregon) and No. 12 seed Liberty (+8.5 vs. Virginia Tech) will look to become the latest double-digit seeds to make a surprising March Madness run. Whether your 2019 NCAA bracket is in great shape or already busted, there are still plenty of college basketball picks to make Sunday. So before evaluating the live college basketball odds, be sure to check out the 2019 NCAA Tournament picks and predictions from the proven model at SportsLine. This model, which simulates every game 10,000 times, has raked in the winnings for those following its advice. Over the past two years, the SportsLine Projection Model has returned over $4,000 to $100 players on its top-rated college basketball picks. It also entered the postseason on a strong 11-5 run on all top-rated college basketball plays. Anyone who has followed it is way up. Now the model has homed in on the 2019 NCAA bracket, studied the latest odds and revealed March Madness picks for every Sunday game. One of the second-round NCAA Tournament predictions we'll give away: The model loves No. 4 seed Virginia Tech (-8.5) to cover against 12-seed Liberty. The Flames caught Mississippi State off guard in the first round, but the model says Virginia Tech's elite defense, which ranked 10th nationally in points given up, will frustrate the Flames in this 7:10 p.m. ET East Regional matchup. SportsLine's projections say that Nickeil Alexander-Walker scores 18 points for the Hokies, who cover in almost 60 percent of simulations. Another one of the 2019 NCAA tournament picks the model is backing: No. 3 seed Houston (-6) rolls to a big win and cover over No. 11 seed Ohio State. Houston, which won the American Athletic Conference regular-season title with a 16-2 conference mark, is led by senior guard Corey Davis Jr. (16.6 ppg). He scored 26 points, including seven 3-points in a blowout win over Georgia State in the first round. The model is calling for him to score 16 against the Buckeyes, while Armoni Brooks adds 11 in the simulations. The Cougars cover the spread in over 60 percent of simulations, while there's also value in the over 132.5 because that hits almost 70 percent of the time. The model also is calling for a top national title contender in the 2019 NCAA Tournament bracket to get a massive scare. You can only see that pick over at SportsLine. So who wins every 2019 NCAA Tournament game on Sunday? And which favored national title contender gets a massive scare? 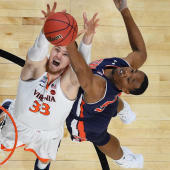 Check out the latest college basketball odds below, then visit SportsLine to see which teams win more than 50 percent of simulations, all from the advanced model that's up more than $4,000 on top-rated college basketball picks the past two seasons.